Having decided to help Dabba explore the replication of their Orange Farm success down here in the Western Cape, it was not immediately clear to me how to go about finding the right place for such a project. Alan Levine of Vanilla (Dabba’s partner in the Cape) initially provided a connection to a local NGO working with schools to provide support services to children affected by HIV to enter formal schooling with the necessary skills. However, after visiting the NGO sites, it was evident that while there was interest in the Village Telco concept, technology and entrepreneurship were not their sweet spot. They could see the value and would make great clients but were not the sort of organisation to drive an idea like this. So, how does one go about finding a Village Telco entrepreneur? Finding the right partner is an all-to-common problem for philanthropists who know (or are at least convinced that they know) what the right thing to do is but have no idea how to find the right people to invest in. Calls for proposals often don’t work because they prioritize the ability to write a proposal not the ability to get the job done. They also tend to attract the usual suspects. So what do to? I am embarrassed to say that the answer was simple, so simple it pains me to reveal it. It was this: drive around. In chatting with my colleage Jason, it transpired that a few years ago, he had provided some mentoring support to a startup cyber cafe called Khaynet in Khayalitsha. He suggested we check them out. This potential lead inspired Alan and I to go and do some scouting of Cyber cafes and related businesses in Khayalitsha. Being a recent returnee to South Africa and a newcomer to the Western Cape, I had no idea whether driving around Khayalitsha was a clever thing for two white guys to do. I relied on Alan’s experience. So far I have found it pretty hard to generalise about personal safety in South Africa, especially in the Cape where I am still finding my bearings. Having said that, from my perspective, the most important thing one can do is actively take reasonable risks. Failing to do that in South Africa runs the risk of entrenching the racial divide. And the Cape is a place where the racial divide is still starkly evident. I live and work in very white Durbanville and Khayalitsha is only about 20kms south but racially is a polaroid negative of Durbanville. Alan and I set out looking for shopping malls, community centres, skills training centres, or anything that looked like local IT or telecom enterprise. The first place we found was at the Zenzele training centre which we happened upon by accident. This is a very cool non-profit initiative doing training and entrepreneurial skills development in woodworking, sewing, steelwork, and a variety of other areas. They actually had an Cyber entrepreneur as one of their denizens but that particular shop/consultancy was not open on the day we visited. Once again, Zenzele seemed like they might make better clients of a Village Telco than operators. Our next stop was to follow up on Jason’s suggestion and visit Khaynet. Khaynet is in the Sanlam shopping centre (pictured at left) next to a busy commuter train station. The shopping mall was a hive of activity. We found Mandla Oliphant, one of the founders of Khaynet, in the cyber cafe. The cafe was busy but with few people using the computer terminals. The principal demand was for photocopies, printing, faxes, etc. In conversation with Mandla, he confirmed that demand for Internet access was fairly modest while demand for “office” services were the principal source of revenue. He confirmed that phone access is a much bigger priority for people than Internet access. Khaynet has been in business since 2003 but have struggled to find a thriving business model based on Internet services. Mandla thought that demand for low-cost phone access would be high in that region. He mentioned that the VoIP startup Digital Indaba had been offering services in the area but that take-up had been mixed due to quality and cost issues. All in all, it seemed to me that a Village Telco would offer Mandla exactly the kind of value-added services that might help Khaynet thrive. Buoyed up by the opportunity that the Sanlam Centre and nearby train station seemed to represent, we then drove to the other side of Khayalitsha to the Khayalitsha Mall. This is a brand new shopping centre that is clearly more up-market than the Sanlam centre. Alan and I rambled about the entire centre looking for IT or telecom related enterprises. 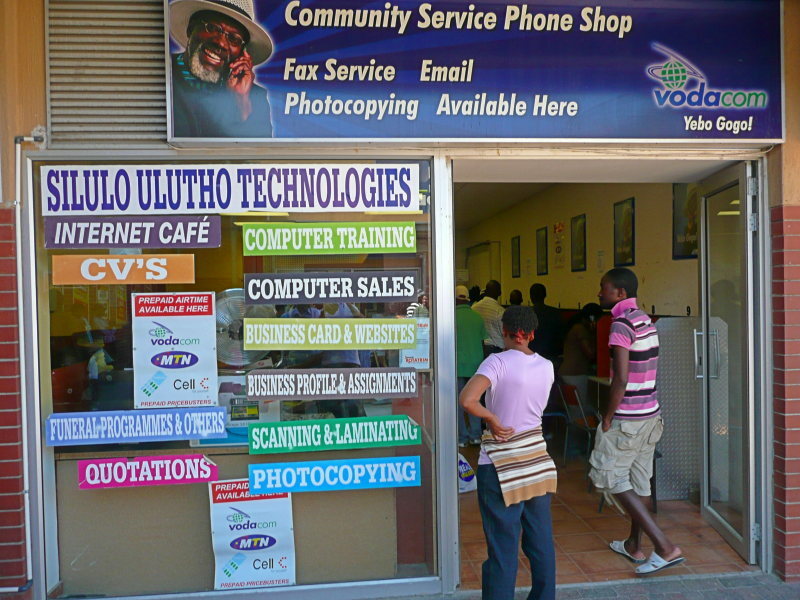 We had almost given up when we came across Silulo Ulutho Internet Cafe (pictured at right). Business at Silulo was booming. The left side of the cafe was devoted to Internet access and office services. Similar to Khaynet there was a strong focus on value-added office services although in the case of Silulo, most of the computers for Internet access were in use. On the right side of the cafe was a bank of pay phones franchised from Vodacom. This was operated by a separate business to Silulo with whom they had a relationship. We met with Sigqibo Pangabantu, one of the owners, and he told us a little bit about Silulo. Silulo Ulutho Technologies offers a range of services from retail computer sales and service, to office and cyber cafe facilities, training, business advice and online marketing. This was one of their two office locations. 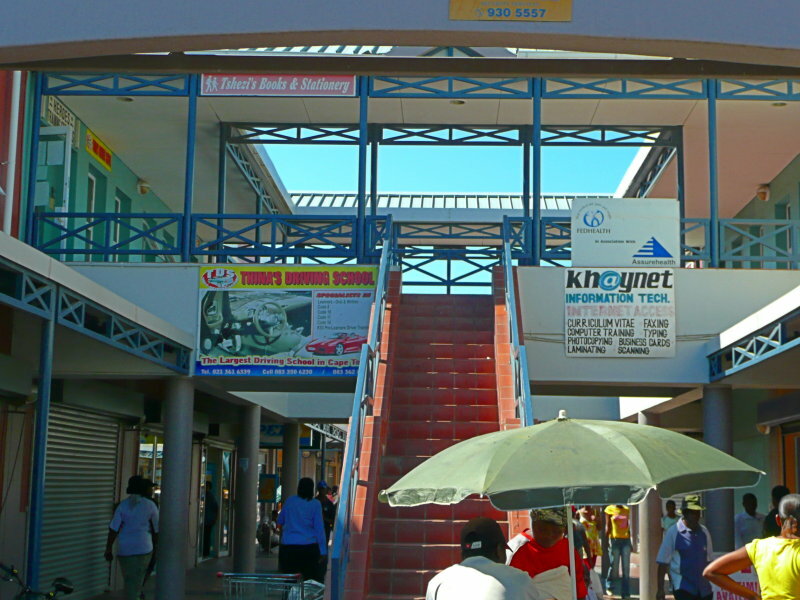 In order to keep up with demand and for reliability, they maintain two Internet connections: a Telkom ADSL line and a wireless link to 24-7online. Silulo is obviously a thriving enterprise. I could see them offering WiFi voice and data services in the area. I could see a Village Telco in operation here but I could also see the potential of something like a pre-configured version of David Rowe’s IPO8 offering a drop-in replacement for the kind of franchised community phone shop service offered by Vodacom. Both Mandla and Sigqibo have expressed an interest in finding out more about the Village Telco and the ball in now in Dabba’s court to explore the next step with them. Stand by for more news. P.S. 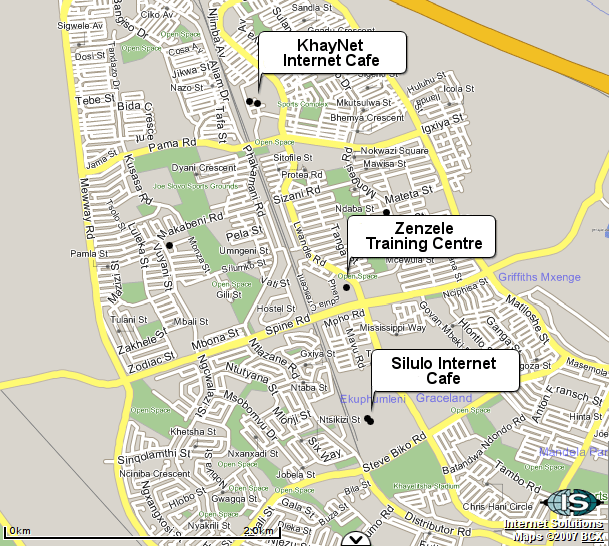 The map at the top of the post came from streetmaps.co.za which is currently knocking the spots off Google Maps in South Africa.